Customer can contact Cyber World by email to get the RMA Request Form or directly fill in the RMA form via online method. Upon receipt of the RMA request form, RMA number will be issued to the customer. Cyber World will not accept any returned product without RMA number. The RMA number will be void if the goods are not returned within 30 days after the completion of the RMA application. 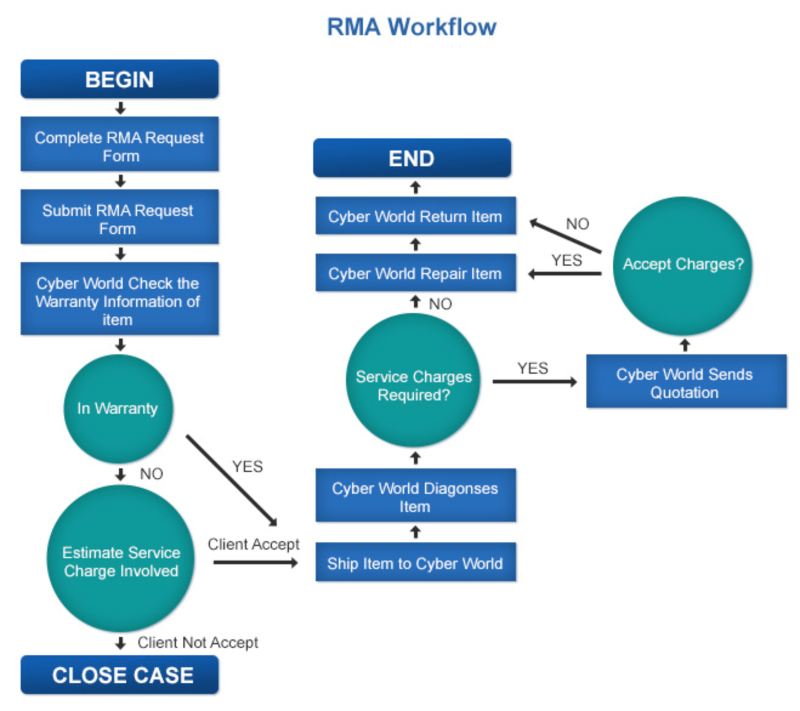 After completing the RMA Request Form and obtaining RMA number, the customer can deliver the product to Cyber World’s office with the RMA number and freight prepaid. Cyber World may request the copies of customer’s bill of sale or other proof of purchase if needed. All returned products for warranty service must be carefully repacked in protective packing materials to avoid damage during delivery. All products applying for Defect On Arrival (DOA) service have to be repacked in original packing with all original accessories included. The normal turn-around time for RMA service is 14 working days (and less than 30 days). Cyber World will issue RMA Report with detailed repair information to the customer after the defective products are repaired and returned. Inspection, repair and freight cost will be charged to customer for products out of warranty period. Customer will receive a quotation detailing all the charges before the repair. For In-Warranty cases , customer is responsible for inbound shipment costs; for Out-of-Warranty cases, customer is responsible for all shipment costs; for Defect On Arrival (DOA) cases, Cyber World is responsible for all shipment costs. You can search further warranty information at the Warranty page. Natural disasters or damage due to other factors not caused by our products. Replaced faulty parts or components will not be returned to customer. If customer does not collect the repaired item within 90 days, service centre has the right to dispose the repaired items.